IHCD relishes the opportunity to work with clients as early in the design process as possible to provide our expertise in required accessibility in line with federal and state requirement but also state-of-the-art inclusive design. We work with a wide range of public and private clients on new construction or major alternation in the built environment from buildings and parks to public rights of way and all types of exhibit design. Our goal is to ensure that the design delivers seamlessly accessible and inclusive experiences. At the invitation of the client, IHCD develops a scope of work, timeframe and budget with sample deliverables shared upfront. In these projects, IHCD commonly reviews for compliance, not opportunities for improved usability, and opportunities for inclusive design. IHCD can share precedents and review specifications if desired. Hourly design review. A few hours of design review can prevent a much more costly post-construction problem. This is commonly made available to existing clients. IHCD is the only US representative in the governing structure of the International Association for Universal Design (IAUD) based in Japan. IHCD conducted the first international benchmarking study on the integration of universal design into the built environment for the government of Singapore. IHCD has hosted or co-hosted five international conferences on inclusive/universal design between 1998 and 2006 averaging 32 nations participating. IHCD has been a lead organization in the international Universal/Inclusive Design movement, having hosted or co-hosted five international conferences as well as international student design competitions, awards programs, smaller regional meetings and publication of web and print materials. IHCD collaborates and presents at international events, writes and publishes in global publications and collaborates on regional and national inclusive design projects. IHCD began the Access to Design Professions project with support from the National Endowments for the Arts (NEA) in 1999 as a memorial project to Ron Mace, considered the ‘father’ of universal design in the US. This international initiative focused on increasing the number of people with disabilities who enter and thrive in the design professions. IHCD tailors training on inclusive design for public and private entities and service industries including universities, cultural facilities, public entities, corporations, financial services, healthcare, libraries, domestic violence and emergency management. These trainings are organized to present guidance on the information, communication, physical, social, service and policy environments central to impacting the contextual definition of disability. IHCD has been involved with the UN Department of Economic and Social Affairs before, during and since the development of the Convention on the Human Rights of People with Disabilities (CRPD) and attended the development meetings and trained the delegates and UN staff on universal/inclusive design. IHCD leaders provide an average of 30 lectures on inclusive design annually. Audiences range from international and national to local. They include conference keynotes and workshops but also lectures for design students and design professionals. 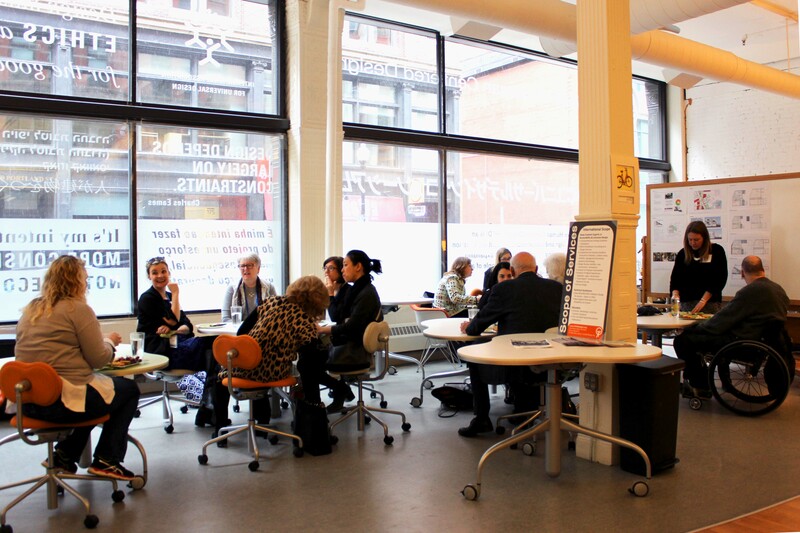 Every year there is a mix that includes professional development for designers, public health professionals, as well as events related to inclusion and the innovation economy, aging, sustainability, livable communities, housing and urban planning. Da Vinci Touch (January 2015), a tactile book with print and digital French and English in collaboration with the Cité des Sciences et de l'Industrie in Paris. IHCD’s 2018 publication will be Inclusive Learning Spaces for Higher Education.